This entry was posted in Mental Health, Substance Abuse and tagged Alcohol Abuse and Addiction, Co-Occurring Disorder, Pain, Signs and Symptoms on June 13, 2016 by Baxter Ekern. Contributed by Serenity Knolls clinical team member Kathryn Taylor, MA, LPC/MHSP. In light of PTSD Awareness Month (June), we’d like to shed light on an often-overlooked sufferer of the disorder: domestic abuse victims. Before we get into how domestic violence can cause the victim to suffer post-traumatic stress disorder and alcohol problems, let’s look at what exactly domestic abuse is. Many individuals, both men and women, experience domestic abuse and may not be aware they have experienced such a serious situation. This is because domestic abuse is not always completely obvious. Abusive relationships may involve emotional or mental abuse that often go undetected. In many cases, abusers will break down the victim’s self-esteem in subtle ways long before any physical violence takes place. The National Coalition Against Domestic Violence (NCADV) defines domestic violence as, “the willful intimidation, physical assault, battery, sexual assault, and/or other abusive behavior as part of a systematic pattern of power and control perpetrated by one intimate partner against another. Power and control are the central and most common goals of an abuser. This may include manipulation, deceit, guilt and blaming, “mind games,” jealous accusations, financial manipulation, or pressure to engage in undesirable activities. Mental and emotional abuse can be just as mentally traumatic as physical abuse, and many abuse victims recall and struggle in similar ways with the mental confusion and abuse that went along with physical violence. In more severe cases, abusers may engage in physical violence, destruction and even torture. 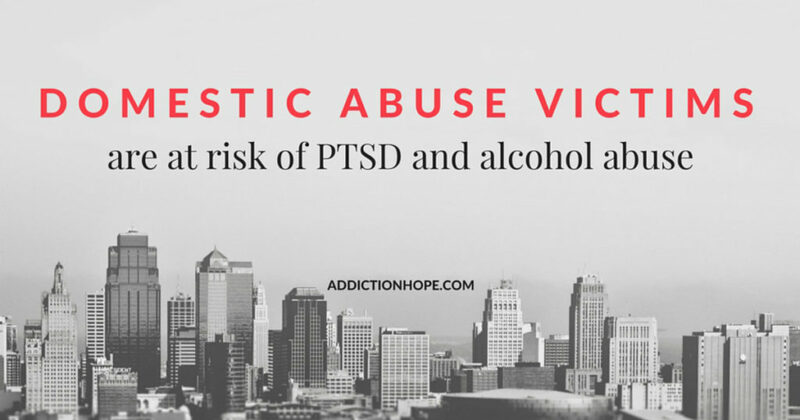 All types of abuse can lead to post-traumatic stress. Relationship abuse often operates in a cycle. Abusive individuals are not always abusive, and may be quite charming and apologetic. This causes a great deal of confusion for the abused individual. Social and financial pressures – as well as constant mental and emotional manipulations – often keep individuals embedded in these unfortunate circumstances. All of these symptoms are highly troubling for anyone to experience, yet they can be treated with the help of a good mental health professional. Although it is easy to feel isolated under these circumstances, these symptoms make sense if you have experienced domestic abuse. However, it is possible to experience healing from these very disturbing experiences. Additionally, the combination of PTSD and alcohol use disorder leads to an increased likelihood of experiencing other mental health conditions, such as anxiety and depression. It may also lead the person into other dangerous situations and put him or her at risk of being traumatized again. It is absolutely vital that any person who struggles with PTSD, a history of abuse and/or alcohol use seek immediate support and treatment. It may seem overwhelming at first, but the right kind of supportive help can help ease these uncomfortable and distressing concerns. If you or someone you care about has experienced emotional or physical abuse and may have a drinking problem, please consider looking into treatment today. What are some healthy activities you regularly participate in to help reduce stress? Please add your comment at the bottom of this post. About the Author: Serenity Knolls clinical team member Kathryn Taylor, MA, LPC/MHSP has several years of experience working in dual diagnosis addiction treatment, women’s issues and trauma treatment as a licensed mental health counselor. Site Description: Serenity Knolls is a premier residential alcohol and drug treatment center located in scenic Northern California. Serenity Knolls offers a multi-faceted approach including individual and group therapy, 12-Step meetings, family therapy, psychiatric care, recovery groups, addiction education and relapse prevention. By offering comprehensive care for any underlying mental health concerns along with the 12-Step philosophy, Serenity Knolls has successfully helped over 5,000 clients in over 25 years of service. We at Addiction Hope understand that addiction results from a combination of environmental and genetic factors. If you or a loved one is suffering from any type of addiction, please know that there is hope for you, and seek immediate professional help.